Call me crazy, but I love mornings. My internal clock always goes off at 6 AM, so I almost always am up to an early start. If it’s a work day, I’m getting dressed, doing the whole makeup and hair thing, making Mark and me breakfast, and slowly easing into the inevitably crazy day ahead of me. Truth be told, I’m at my most productive in the mornings; therefore, I always try to pound out as much of my to-do list as possible before noon. Honestly, I wake up excited to start my day 99.9% of the time. I love feeling refreshed. I love feeling rejuvenated. I love feeling new. And I freakin’ love eating breakfast. Oh, what a wonderful world I was missing. There ain’t a better way to start off my day than with a mouthful of sweet, crunchy granola. Especially when it tastes like one of my all-time favorite desserts: banana bread. I’m calling it now: Banana Bread Granola is the new breakfast frontier. It’s sweet. It’s toasty. It’s chewy. It’s all that you could possibly want in a breakfast…and more. I freaking <3 this granola. 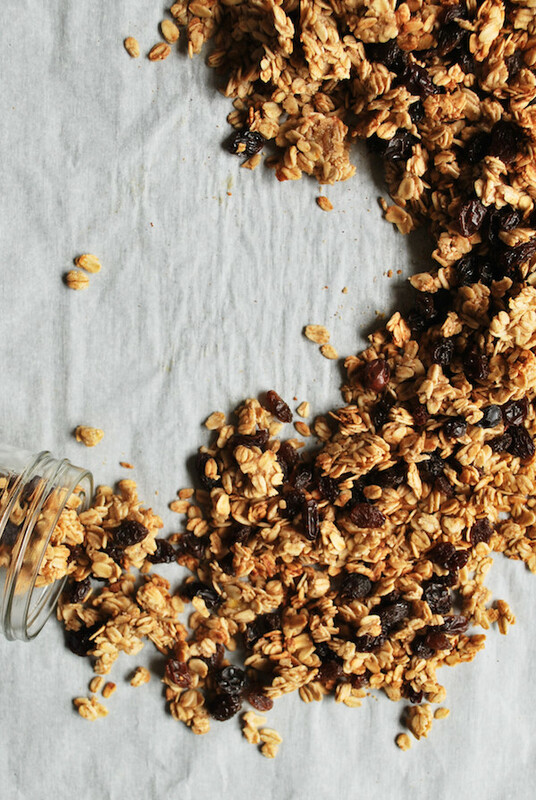 Homemade granola may sound like an intimidating, daunting task. But I promise you that this banana bread granola takes all but 5 minutes to mix together. After 25 minutes in your oven, your house will smell incredible, your stomach will be a-rumblin’, and all of your breakfast dreams will come true. First, it takes 7 ingredients to make. And, if you’re reading this, you probably have most, if not all, of them in your kitchen rightthisverysecond. Second, to get the banana flavor, we’re adding…mashed banana! The banana caramelizes in the oven, giving this granola that unmistakable banana bread flavor. It also creates sweet little banana-oat clusters, which are super chewy and oh-so addictive. It’s possible that I picked most all of the them out to munch on while photographing. Oops. Third, you must try this for breakfast. Douse it with a little almond milk, add some sliced banana, and watch out!… you’ll have a delicious, nutritious breakfast on your hands. Yes, you can create a healthy and satisfying breakfast with minimal prep time. Imagine how pleasant your morning wake up will be when you realize you have a huge pile of banana bread granola waiting for ya. No more waking up on the wrong side of the bed for you! 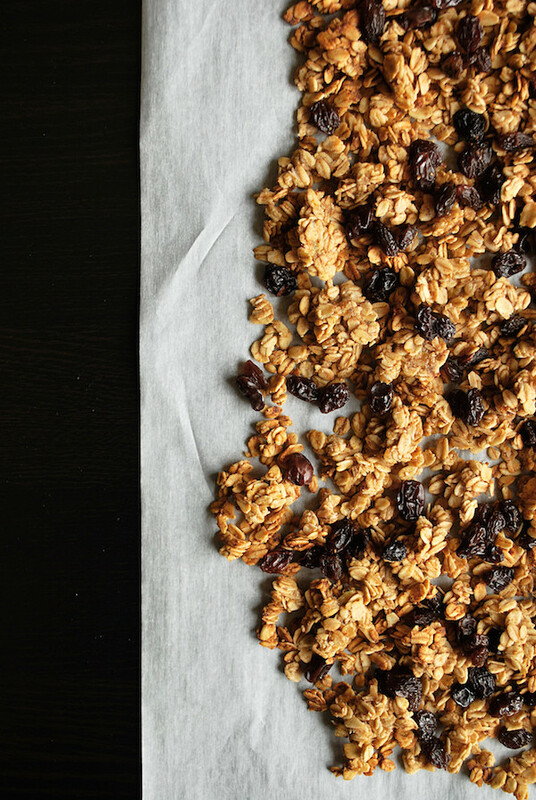 You mustmustmust try this banana bread granola! 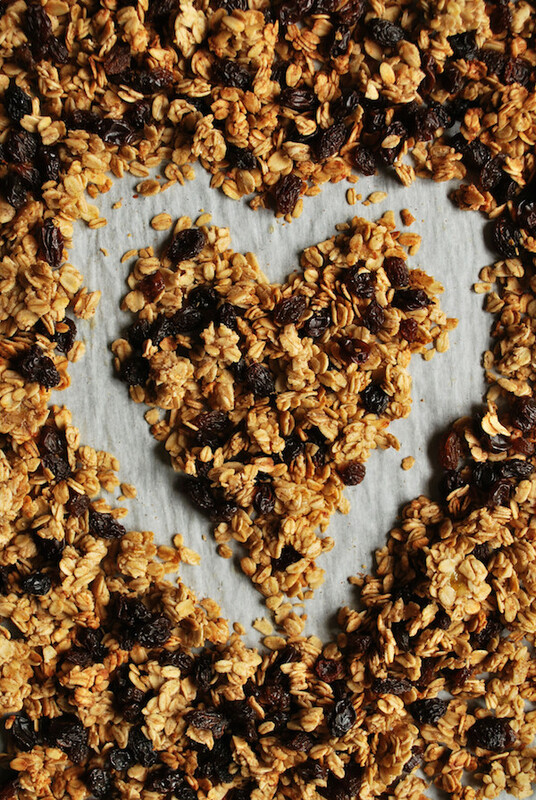 7 simple ingredients stand between you and one of the best granola experiences of your life. Heck, you may even become a morning person because of this simple 30-minute recipe. Now how can you argue with that? Add coconut oil, banana, maple syrup, cinnamon, vanilla, and salt to a large bowl, and mix until well combined. Try to remove the big chunks of banana, but it’s OK if a few small chunks remain. Add oats, and mix until each and every oat is coated with your wet mixture. Turn oat mixture out on the prepared baking sheet and form into a thin rectangle. Place in the oven and bake for 20-25 minutes, or until oats are toasty and golden brown. Halfway through the cooking time, be sure to GENTLY mix the granola – you don’t want to break up all of the big chunks that will form. During the last 5 minutes of the cooking time, add in your raisins and optional walnuts. Remove from oven and allow to cool completely before storing in an air-tight container (I’m partial to mason jars). Alexa, I’m realizing it’s scary how similar we are as I read this post! I’m up at 6 am for work everyday as well… and usually on the weekends too because of my internal clock ;) I absolutely LOVE mornings and totally agree that it’s so much fun getting a million things done before noon! And as far as breakfast goes—- I pop out of bed excited for that big bowl of oatmeal calling my name! But this granola, oh my goodness it looks mouth-watering! I’m a sucker for banana bread, so I’m sure I’ll be loving this as well!!! wow wow wow, YUM. I LOVE making my own granola..saves ya on so much sugar and money!